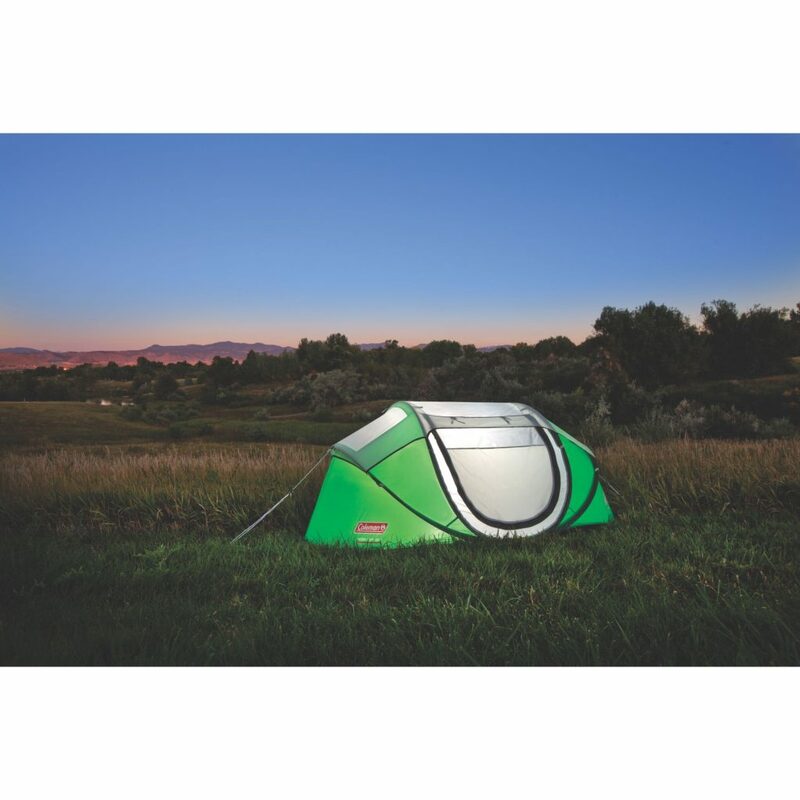 The pop up tent - perfect for festivals, kids, and summer camping. Key advantages over the traditional dome style tent include, size and weight, affordability, and of course speed and ease of set-up. 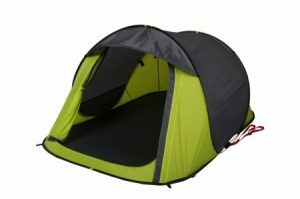 Quality has been an issue with pop up tents in the past, with poles breaking and material tearing. However as they have become more and more popular over the past few years, the quality has improved significantly and now there really are some great options out there that serve as attractive alternatives to traditional style tents. 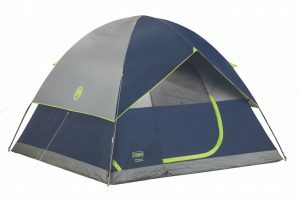 We have reviewed what we consider to be the 3 best pop up tents available in Australia and award the Explore Planet Earth Pop Up Tent the top spot. Detailed reviews below. 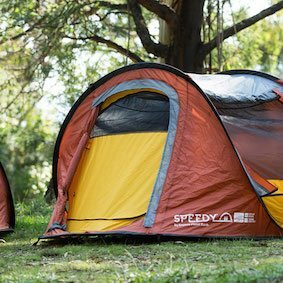 Our number one pick for Australia's best pop up tents is the Explore Planet Earth Speedy Pop Up Tent. 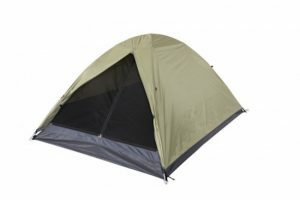 It provides the perfect combination of quality, weatherproofing, features, good looks and affordability and we think it’s easily the best pop up tent available in Australia. EPE stand by this product with a 2 year warranty, providing peace of mind in case anything does go wrong. EPE claim the title of the world’s fastest tent and we find it hard to argue with that. 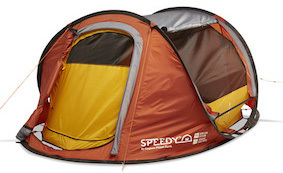 Like most pop up tents, the Speedy comes folded up in a circular shape, packed inside a handy carry case. 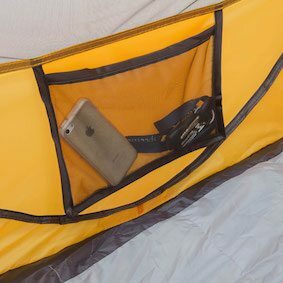 The user simply needs to remove the tent from the case, and it pops up instantly. Secure the four corners with the pegs provided and you are done. Unlike many pop up tents, EPE cuts no corners here on quality, and if cared for properly the Speedy should provide you with many years of camping enjoyment. The floor is made from durable Nylon boasting a 2000mm waterproof rating, while the outer is Rip-Stop Polyester with an impressive 3000mm waterproof rating and fully taped seams. Waterproofing should not be an issue here, even in heavy rain. The inner is a breathable Rip-Stop Polyester. Features in the Speedy include reflective guide ropes, accessory pockets, and fire retardant materials. A No-See-Um mesh provides ventilation, protection from bugs, and privacy, while side windows contribute to ventilation also. However the stand-out feature for us is the Aside Intents Lighting System™. 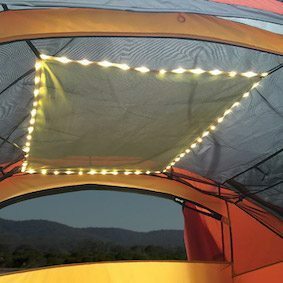 Speedy comes with integrated LED lights that work with a USB battery adapter or power bank providing the perfect level of lighting for finding your way around the tent in the dark. This is a really clever addition from EPE and one of the things that makes Speedy stand out above its competition. Tried and true, the Coleman pop up tents have served thousands of families and festival goers over the years. 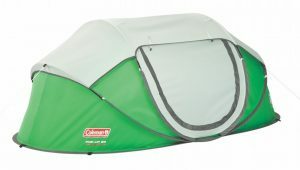 A reliable, affordable option, the Coleman pop up is made with quality materials and a well thought design. 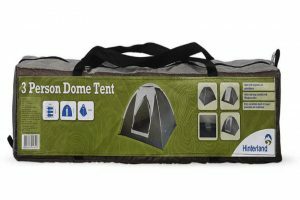 It’s a great looking tent and we have no hesitation in recommending it for Australian summer camping. One of the best pop up tents on the market. 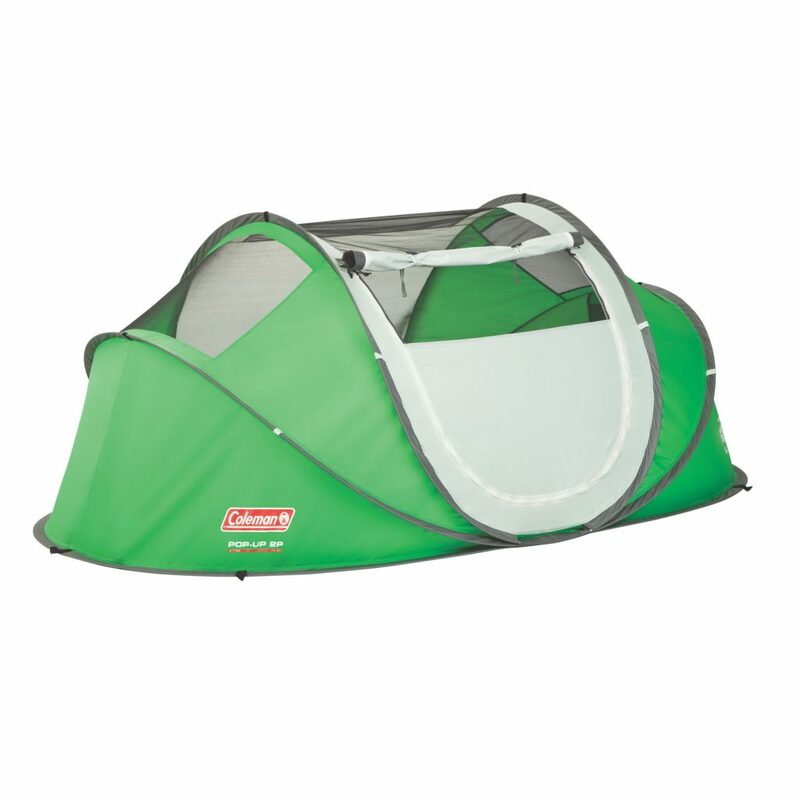 Coleman have made the set-up for their pop up tent as easy as possible. 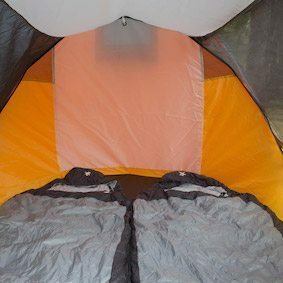 Simply remove from the carry bag and the pre-assembled poles mean the tent pops into shape instantly. The only other step required is securing it down with tent pegs and fastening down the guy ropes if you expect wind or rain. It packs up just as fast meaning you get more time to enjoy your adventure and less time packing up. 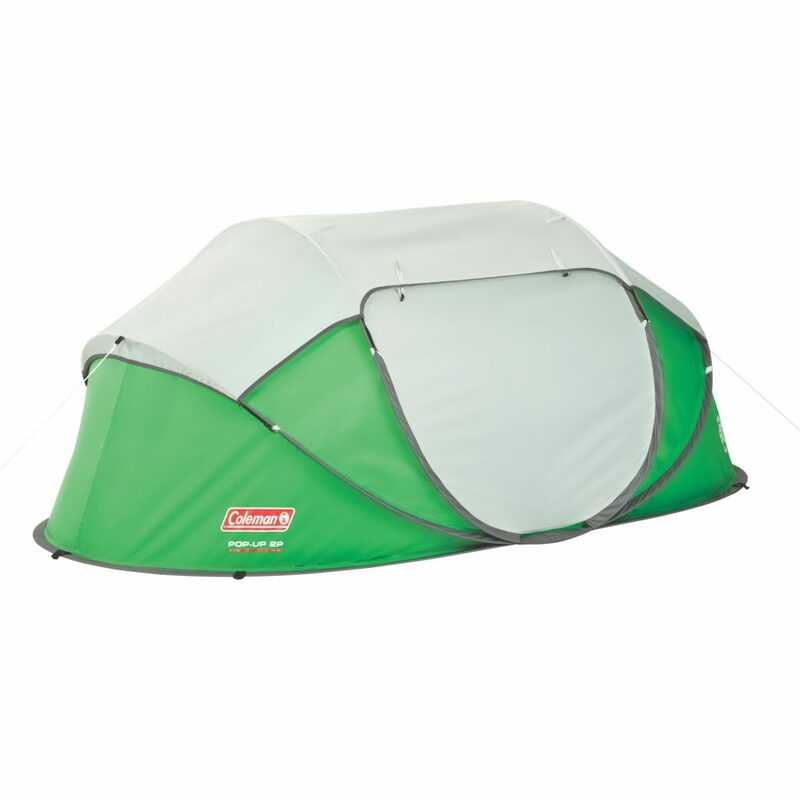 The fly on this tent is made from waterproof 68D polyester while the floor is 185T polyester. It’s fully seam sealed which means you should stay dry in even in very wet conditions. One advantage the Coleman pop up has over our number one pick is that it has the option of guy ropes, which provide additional stability in high wind. The fly on the Coleman pop up can be set up in a variety of positions, allowing you to prioritise protection or ventilation depending on the conditions. There are two internal storage pockets to assist with organisation, along with a handy carry bag to keep it all together once packed away. An awesome option for those on a budget but still want a good quality, waterproof pop up tent. The Blitz is the standard pop up design, utilising an instant up pole system where sprung steel poles are incorporated into the tent. Both set up and take down should take under a minute giving you valuable time back to enjoy your camping holiday or festival! While potentially not quite as sturdy as the Speedy and Coleman tents reviewed above, the Blitz provides perfectly acceptable weatherproofing for short getaways or festivals, especially in summer conditions. The outer is UVtex Sun Tough fly fabric with water repellent treatment while heat taped seams, heavy duty PE floor, and velcro storm flaps provide an extra level of comfort in case you do get unlucky with the weather. 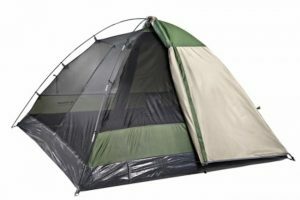 This tent is packed with most of the features you would expect from the more expensive varieties, including no-see-um mesh providing insect protection and ventilation, light attachment point, internal storage pockets, large easy access door, and a handy carry bag. Oztrail also offer a 2 Year Manufacturer's Warranty against defects of material or manufacture.